Striking and very uncommon, It has to be cherry if you're a bit of non-conformist. Like a well made cosmo, Cherry heartwood (from the center of the tree) is blushed ever so slightly pink. the sapwood (from just beneath the bark) is just off-white. For all our other hardwood's, visible sapwood is usually kept to a minimum, but when it comes to cherry we think the combination of the delicately reddened heartwood and bone coloured sapwood is irresistible. The grain is nearly always straight but can be irregular and curly every once in a while. Some small to medium sized knots and fissures can be present. We always try to keep these visible unless you request otherwise. Open fissures are discreetly filled on the table tops but left as nature intended on the benches and stools. 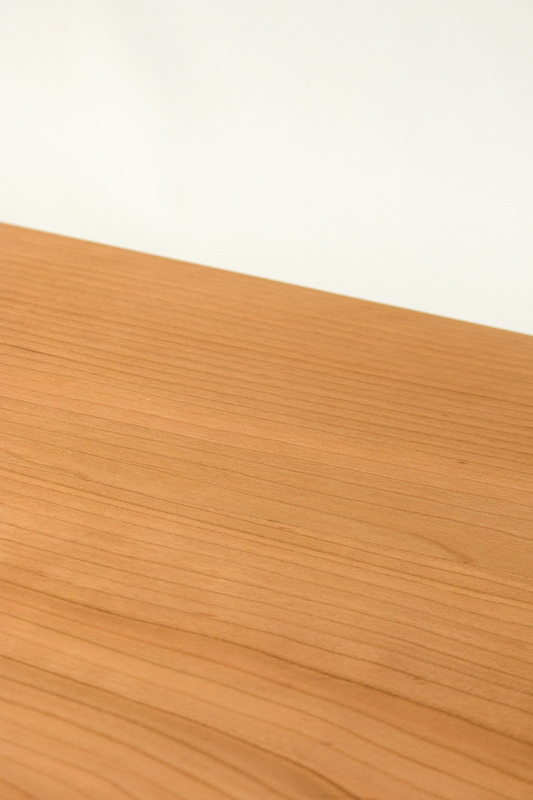 Cherry is perhaps the most inherently beautiful of our four standard timbers. To preserve natural colour, the oils used on cherry are completely transparent and will form an incredibly durable, natural looking finish that will protect the piece for many years to come. The finished timbers will contain tones ranging from salmon-orange and pale pink to aged ivory.